As it is with my other marshmallow critters, this one is just as easy, maybe even easier. All this creation takes is a few ingredients, a bit of time, add some friends into the mix, and you’re all set. I guarantee you’ll have a great time making and sharing these cute little guys. Ingredients: For as many as ingredients will allow. Step One – On Silpat or parchment paper, use a rolling pin with spacer bands or pasta maker to roll out the yellow fondant to about ¼ inch thickness. 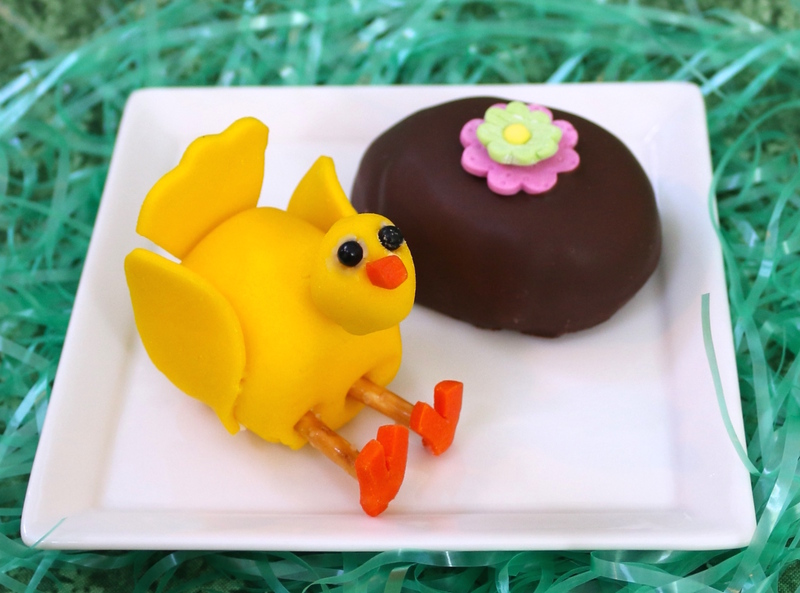 Step Two – For the body of the Baby Chicks, place a regular marshmallow on the piece of the rolled out yellow fondant and cover. Cut off any excess and tuck the ends under the base of the marshmallow. Step Three – For the wings, roll out more yellow fondant. With small leaf cutter, cut out two leaf shapes for the wings Place dab of white icing at the base of each leaf shape (wing) and then press it to the side of the body. Hold it for a few seconds to ensure it adheres. Step Four – For the tail feathers, using more of the rolled yellow fondant, cut out one small pumpkin shape. Cut off the sides of the pumpkin shape, stem side down, at an angle to create a wedge. Place dab of white icing at the base of each tail and then press it to the back of the body. Hold it for a few seconds to ensure it adheres. Step Five – To make the Baby Chick’s legs and feet, roll out the orange fondant to ½” thick. Using the very small round fondant cutter, cut two circles. At an angle cut off two sides of each circle. It will make a triangle shape. Cut a small wedge out of the top of the triangle Cut a pretzel stick in half and press one end at the point of the triangle. Step Six – For the legs, using a toothpick, create a hole where the legs will go at the base of the body opposite the tail feathers. Carefully insert the two created leg and feet pieces into the baby chick’s body. The chick will appear as if it’s sitting down with his feet outstretched in front of him. Step Seven – Then make the head. Cover a mini-marshmallow with yellow fondant. Using a toothpick create a hole and insert one-half of a pretzel stick. Holding the head, create three holes for the eyes and beak. Place a dab of white icing over each hole. Gently push two black candy pearls into the holes for the eyes. Using the leftover pieces of orange fondant, create a small beak shape and gently push it into the hole to make the beak. 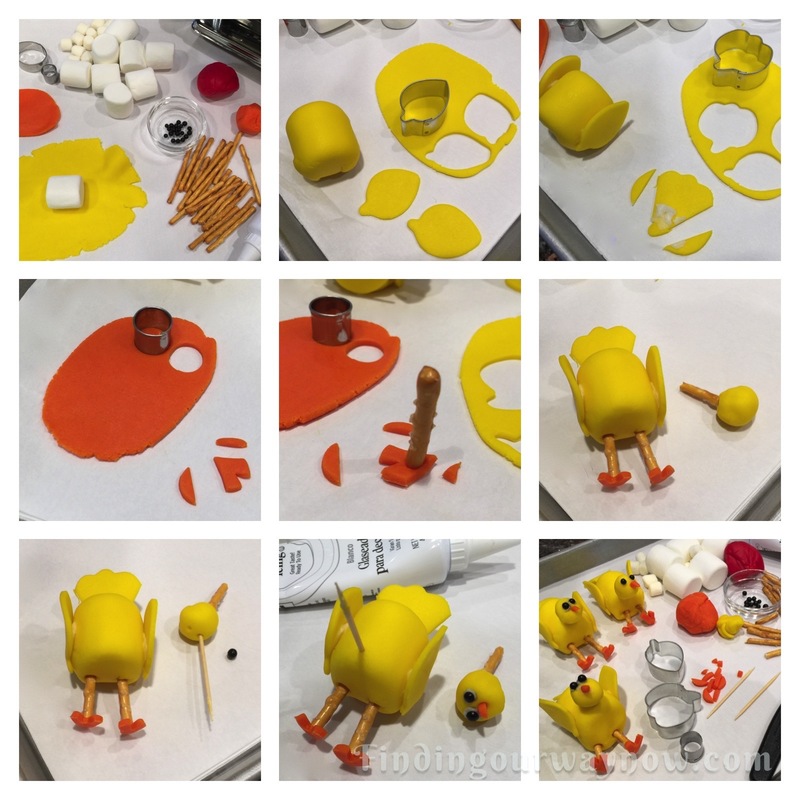 Step Two – Now let’s make the marshmallow baby chick come alive. Using your toothpick, create a hole where the neck/head of the chick will go. Gently push the neck and head into the body of the chick until it’s connected to the body. That’s it; you’re done. Step Three – Repeat until you run out of fondant or other supplies. Now you have a cute collection of Marshmallow Baby Chicks. Notes: I find that using a pasta maker to roll out the fondant gives me a consistent thickness in a hurry. 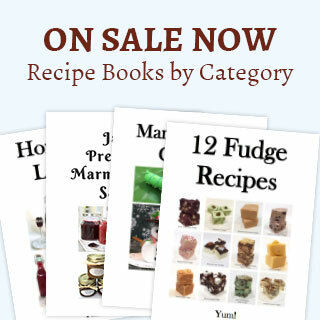 If you don’t have one of these, you can use a ruler or rolling pin bands and a knife. If you’re not able to find yellow and orange fondant, buy white and add food coloring to create the fondant colors you need. 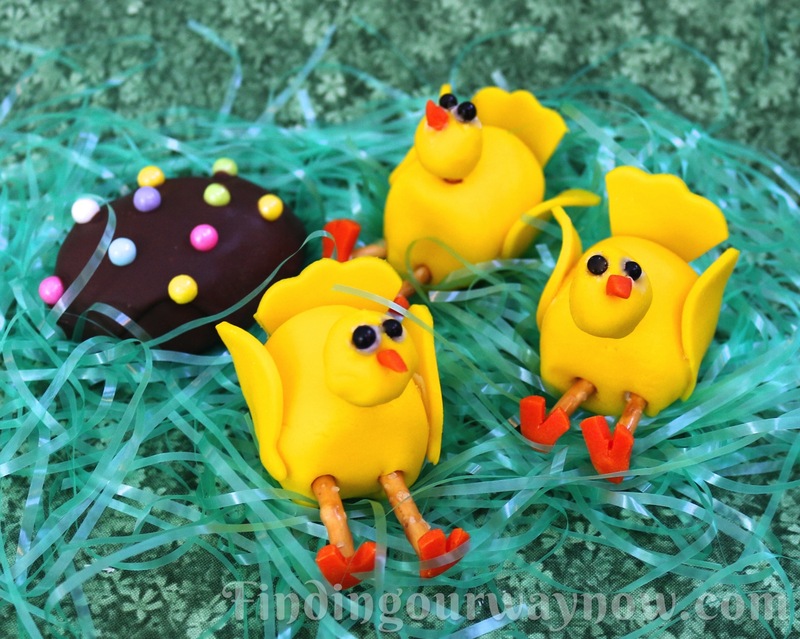 You can decorate your baby chicks with different colored fondant, such as blue, green, pink and orange, so have fun with it. I use pretzel sticks as a connector so that the whole thing is edible and for everyone’s safety. I always like to use a sheet pan lined with parchment for easier assembly and cleanup. I always have fun creating these Marshmallow Bumblebees. My husband tells me I never left first grade teaching. He calls these guys my baby turkey chicks… LOL. What do you think? These are ready made for a cool kid activity in the kitchen. 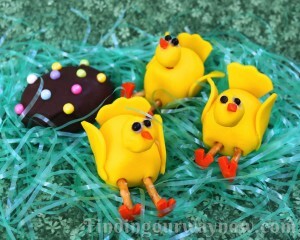 They are especially fun to make a gift, why not add my Chocolate Covered Peanut Butter Eggs to make it extra special. I add a bit of this and that to make a bunch of pretty packages then add a bit of ribbon and a gift tag to give them to my neighbors, friends, my family, practically anyone. 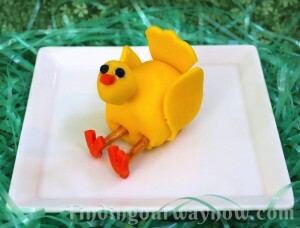 These baby chicks can also make great party favors for any kind of celebration. Regardless of what you choose, I guarantee these bring on big smiles. I’ve said it before about my other marshmallow critters; these little guys are great fun to create for anyone at any age.